Honda Grazia Scooter Launched at Rs. 57,897 (Ex-showroom Delhi). 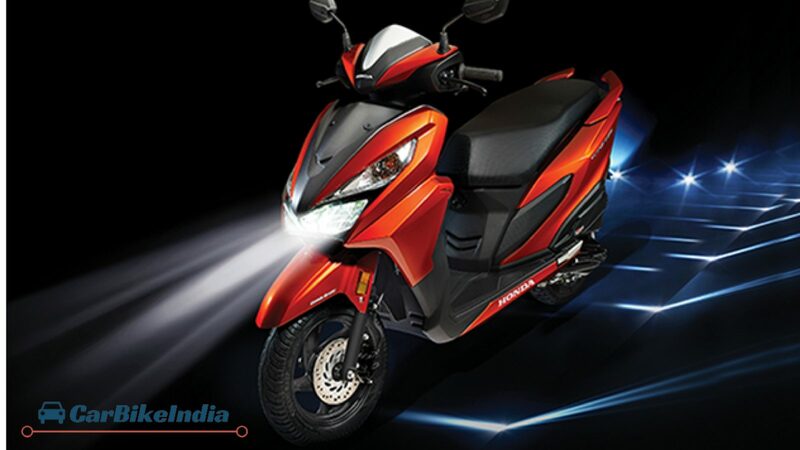 The Grazia 125 cc Scooter gets large twin headlamps, indicator lights incorporated in the front apron, small visor and 12-inch black alloy wheels. Honda Motorcycle and Scooter India (HMSI) has launched its Grazia scooter at the price tag of INR 57,897 (Ex-showroom Delhi). With the launch, it has become the fourth product from the company introduced this year, other three being African Twin, Cliq and CBR 1000RR Fireblade series. Bookings for the new Grazia Scooter have already commenced from October 25 at the nearest company dealers with the deposit amount of Rs. 2000. With the new Grazia scooter, company is targeting the cosmopolitan and young customers in the country and it has been branded as ‘Advanced Urban Scooter’ by (HMSI). Grazia Scooter reflects the amazing design of new automatic scooter. The new Honda Grazia scooter is loaded with various features such as revised instrument console with digital display, large twin headlamps and indicator lights incorporated in the front apron, small visor and 12-inch black alloy wheels. In terms of safety, the bike gets 110mm front disc brake with Combi-Braking System (CBS) that distributes the brake force between both wheels when the rear brake is pressed. Other features include telescopic front forks, a small storage space at the left hand side and USB charging placed under seat storage compartment for keeping pace with modern times. New Grazia Scooter also gets Auto Headlamp on function (AHO), dual-toned paint scheme and chrome detailing. The new Honda Grazia scooter is powered by the 124.9 cc, air cooled, 4 stroke SI engine that at present, is also working in Honda active 125. The engine comes with (HET) Honda Eco Technology and is able to produce 8.52 bhp at 6500 rpm and yields the peak torque of 10.54 Nm at 5000 rpm. New Honda Grazia in the 125 cc segment will give strong competition to a number of scooters present in the market such as Vespa VX 125, Suzuki Access 125 and Mahindra Gusto 125.